A person leaves their mark on the world. For a visual artist, those marks are literal ones: A scratch of charcoal on textured paper, a dab of color applied thickly to a board, a swatch of fabric sewn into a quilt. Whatever marks we make in our time here, they stay behind when we leave. Whether those marks changed the minds of our students, the hearts of our friends, or the shape of the landscape, we cannot help but make the world a different place while we live. That is the creative spirit of mankind. We rearrange the universe, and that change is the legacy we leave. The visual legacy of Patricia Kearney is on display at the Erie Art Museum's Ronald E. Holstein Gallery through mid-September with The Art of Patricia Kearney: Selected Works 1975-2013. You will likely get only one chance to see many of the diverse pieces of art which are displayed in this show. To see the representation of a lifetime's work in one place is a rare privilege, and no future work from Pat Kearney is coming. The marks she was making on the world ended in March of last year. Shortly after Pat passed away, the Erie Art Museum made plans to gather together paintings, drawings, and sculptures to add to the four they already held in their collection. The resulting show gives an enticing snapshot of the creative legacy of this multi-talented artist. Pat left the Erie art scene in the early '90s for the warm dryness of Arizona to be closer to her family. While she had no children of her own, her nieces and nephews loved their Aunt Pat like a mother. In Northwest Pennsylvania, she left behind close friends and adoring students. While here, she helped found The Lake Erie Fiberarts Guild, which is still going strong and has such luminary member-artists as Carol Posch Comstock and Deborah Sementelli. Pat taught drawing, design, and painting classes at Edinboro University for 18 years. Her art fundamentals classes always gave her students a solid grounding in visual observation. According to Mary Jane Kidd, a friend and fellow teacher, she went out of her way to give each student what they needed to be successful and impressed her students with her proficiency in every medium she taught. 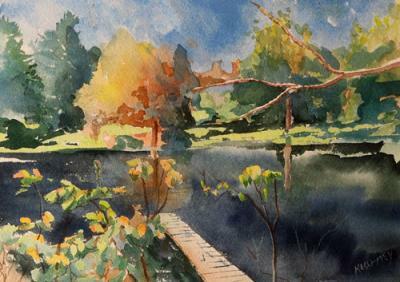 "Inlet," a moody and gestural landscape from 1992, shows a Winslow Homer-like mastery of watercolor. Though highly abstract and impressionistic in the extreme, the picture accurately expresses the light of the day and the feel of the place. One of her former students, artist Dianne Boone, remembers watching her demonstrate the technique to her class: "She had a wadded up paper towel in one hand and a brush in the other, and she'd be painting and blotting and painting and blotting, and all you could say was 'wow'." Henri Matisse said that, "creative people are curious, flexible, persistent, and independent with a tremendous spirit of adventure and a love of play." This is especially true with art teachers. The spirit of adventure and independence shows up in every corner of this retrospective. Pat worked in so many media and so many styles that one wonders how she managed to become so proficient in all of them. There are quilts and oil paintings and charcoal drawings – all of which show a deft hand. Mary Jane Kidd speaks of how productive Pat was: When they worked together at Edinboro, she saw Pat work in her sketchbook every day. There is a collection of sketchbooks in the gallery placed in a case and left open to pages that pertain to finished pieces in the show. It is a rare treat to see the thought process come alive like this. By looking at the studies in her journals, one can get a sense of why Pat rejected some design ideas and included others, how she picked colors, and why her draftsmanship was so good. It is a shame that a visitor to the show can't peruse deeper into these treasures. They are, of course, true treasures: one-of-a-kind records of a great artist's working process – and hundreds of grubby fingers tearing at their pages would be ruinous. If a viewer wants to delve deeper into Pat's work, there is a catalog available in the Art Museum gift shop that includes work that is not in the show. There are a few pieces in this show that are for sale if a collector wants to own a bit of Patricia Kerney's legacy. One of those is an extremely cute papier-mâché sculpture of cats climbing up walls, chasing string, and causing general mayhem called "Inside Cats/Outside Cats." Pat was known for her love of cats, and always had at least one rescue animal in her home and was a supporter of The Humane Society. Her sketchbooks, too, are filled with cats, both gestural studies and finished colored pencil drawings and all of which seem to capture the essence that is feline. Pat found magic in the ordinary. Everything in her domestic world seemed to fascinate her. The visual interest of overlapping leaves on a houseplant or the texture of a pie crust were as worthy subjects as Greek mythology or Biblical narratives. Her acrylic painting "Strawberry Pies" is as well-crafted and simple as any work by Wayne Thiebaud but lacks the irony. In fact, there is a refreshing lack of anything ironic in her life's work. You can tell that Pat was genuinely enamored with the process of observing the visual environment and then interpreting it as a design in paint, charcoal, colored pencil, or whatever medium she felt was the right one for the job. Pat never got famous. She never got rich. Her success was measured in that she made it through life as a professional artist and teacher doing what she loved. Ultimately, she made her art for the joy of creation and for the joy it brought to others. This show gives hope to all of us who live creatively that each of our life's works will not be in vain. When we are gone, people who love and respect us may gather together many of the marks we made on the world and display them for all to see. At the Erie Art Museum, Patricia Kearney's legacy is still making marks on the world. The Art of Patricia Kearney: Selected Works 1975-2013, Ronald E. Holstein Gallery, Erie Art Museum, 20 E. Fifth St., June 20 to Sept. 13. Pen Ealain can be contacted at PenEalain@ErieReader.com.